"My mind is a jumble of thoughts. That I watched this horse rip a man's throat out only a day ago. That he's the fastest horse on the island. That I'll dishonor my parents' death. That I'm afraid that I'll love it. That I'm afraid I'll be afraid. That I want Sean Kendrick to think well of me. That I need to be able to live with myself at night when I'm lying in bed and thinking about what I've done that day." Imagine you're at Pimlico or the Kentucky Derby, racing against some of the best jockeys in the world. People from all over the country tune in and place their bets as you ride. Okay, now take this scene and transpose it on to the Thisby beach during the first weekend of November. Oh yeah, and the horses, well, they're not your normal Palaminos--they're killer sea horses. Yeah, that's kind of important to mention. This is the start of the annual Scorpio Races and Sean Kendrick, reigning champion, is fighting for something more than just glory this time around. Puck Connelly, on the other hand, never meant to ride in the Scorpio Races but it seems fate has decided to take her down the most unlikely path. And to make matters worse, Puck is totally out of her element being the first and only girl to ever compete in the race. Neither Puck nor Sean can afford to lose and neither is prepared for what's to come. I really wanted to read The Scorpio Races after hearing the dynamic speech Maggie gave about where the idea came from at the National Bookfest. I loved that she drew inspiration from an old Celtic legend and managed to update the lure in a modern and believable way. It's easy to not question the fact that there are killer horses that dwell in the sea or the fact that for pure sport, people from all over the world want to ride them. I guess my problem lies in the fact that, once again, what I got was far different than what I expected to get. I'm not saying the book wasn't enjoyable but it definitely took me awhile to really get into it. There were some parts that I loved and other parts that just didn't jive. When I heard The Scorpio Races was based on legend, I expected it to be much grander and far more mythical than it actually was. I wanted to get immersed in this fantastical world and lose myself in all the action. Really, most of the good action doesn't happen until the race (at the very end of the book). And don't get me wrong, I don't have a problem with little to no action, it's just that I wanted there to be more of it. 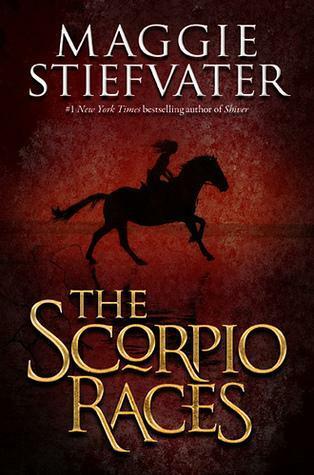 In reality, The Scorpio Races is more a story about people, more specifically, it's about the lives of Puck and Sean. Told from their POV's in nearly alternating chapters, we're given a first-hand account of their inner turmoil and struggles. It's a coming of age sort of book where we watch this boy and this girl grow into these strong, central beings. They make choices that alter the course of their lives and they have to live with the price that it costs them. And while I thought the killer horses were going to be central to the story, they sort of become a rotating backstory to the people that ride on them and the island that depends on them. Again, nothing wrong with this, it's just not the story I was expecting to read. And honestly, I'm not a big horse person. Killer horses I can get down with, but regular horses, they don't really float my boat if you know what I mean. Suffice it to say, the man-eating part really does make all the difference for me. Where Stiefvater does succeed is with her remarkable character introspectives and timeless writing style. Maggie knows her protagonists inside and out. They are real people with real lives and real problems. You learn to feel for them and bond with them and care about them which is what kept me turning the page through to the very end. And her prose is so compelling, spell-binding that you feel like you are really there on a misty morning, listening to the waves crash against the shore as you watch the craziness unfold on the beaches below. World building is definitely her strong suit. 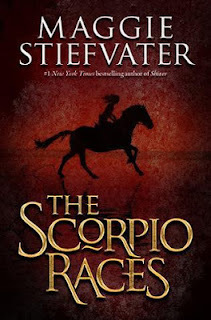 The Scorpio Races was my first experience with Stiefvater's writing and though I was somewhat disappointed, the story was still good once I accepted it for what it was. And can I just say, kudos to her for not making Sean and Puck become merciless victims of insta-love! For once, this is a YA relationship that slowly builds from mutual respect to friendship to the start of love and I, for one, loved that. Rock on, Maggie! Though The Scorpio Races wasn't quite the book I wanted to read, it was still strong by way of its amazing characters and Maggie's compelling writing. I definitely look forward to picking up some of Stiefvater's other works and hopefully, the next time around, I'll get all the mythical satisfaction that I wanted from this book. And seriously Maggie, I could've used more on the killer sea horses because, c'mon, they're KILLER SEA HORSES! I think I just expected more magical stuff (and killer sea horses, haha) than what was given, but all in all, it's not a bad book. I loved her writing style and have The Raven Boys up next on my list of stuff to read! why is there no spark notes on the damn book?! I really enjoyed reading this book and your review was fun to read! I loved Scorpio Races but I can see that with all the expectations you had before the book how it did ring a little flat. I do however agree with you that her writing style is wonderful. I enjoyed Shiver a lot (not so much the last book in that trilogy because I believe it got a little repetitive) and I can't wait to try out The Raven Boys. I enjoyed your response to my Top Ten this week and noticed that we have the same reading tastes so I am now a NEW FOLLOWER! Thanks so much, Kay! I'm really happy you enjoyed the review! Yeah, I think my expectations for this one were a little different, but it was still so well-written. I really think you'll enjoy The Raven Boys (I LOVED it!) and I've had the Shiver trilogy on my list for awhile now, so I'm excited about that. One of the best books I've read in a while. This author writes in such a haunting, poetic way, but without carried away so that the imagery takes over the story. The plot is interesting, the characters are ones you can believe in and the setting is cool (like an alternate 1920's). Definitely recommend!